As you might recall, over the summer I got my first pizza stone and have since made an effort to use it as much as possible! It’s been tough to find time, but recently I spent an evening playing around with some new ingredients (with the help of my girlfriend… who pointed out that I’ve never mentioned her on this blog)! My first foray into pizza making involved pretty simple pies (My First Ever Homemade Pizza: Simply Delicious), and I decided it was time to crank things up a notch. I won’t bother you with all the details… but I made some dough… let it sit… stretched it… put some stuff on it… and popped it in the oven. Then I ate it. I repeated that process three times. Each pie was delicious. The major difference between this pizza making experience and my previous one was as follows: I used the same amount of dough in each instance, but this time around I made three pies instead of four pies. Thus, each pie was a little bigger. I started off by keeping things simple with a Margherita pie — La Bella San Marzano tomato sauce, fresh mozzarella, and some home grown basil… topped off with a splash of olive oil and some grated parm. 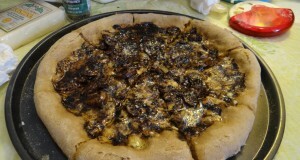 On pie number two I added my two favorite pizza toppings: mushrooms and onions. We spiced things up a bit with some sea salt, garlic, and pepper. 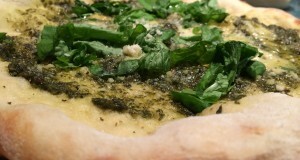 We used Paulie Gee’s Arugala Shmoogala as the inspiration for our third and final pie of the evening. It consisted of baby arugala, tomato sauce, sea salt, olive oil and parm. I’m really happy with the way my pies are coming out. I can definitely work on shaping them a little better (okay, a lot better), but as long as they keep tasting good, I’m a happy camper. I’ve been impressed with the type of crust I’ve been able to achieve in a conventional oven. But I attribute most of the great taste to the high quality, carefully selected ingredients I use for each pie. Stay tuned for more homemade pizza updates soon!